LAST YEAR, in the Fall of 2015, our congregations in the Gulf Coast took part in a five-week spiritual growth initiative (September 28-October 25, 2015), to grow our churches in depth and in breadth. The series was written by Methodist Bishop Robert Schnase. It is entitled Five Practices of Fruitful Congregations. This year, 2016, we are doing Committed to Christ. Both Five Practices, and Committed to Christ are excellent. Choose which is best for your congregation at this point in time. To engage the entire congregation in thinking, praying and discussing the purposes of the church. Bond the congregation together, building strong friendships. Grow faith through prayer, study and caring conversation. Close the back door of the church. Become cells for care, service and mission. In addition to this, each group is encouraged to do a service project together. The series ends with an invitation for each family to consider and plan their giving for the coming year. The five booklets to the left of this photo each have three sessions for leaders of the ministries that oversee these areas. Session 1 is a Bible Study on one of the five practices. Session two delves into the practice. Session 3 is “What Can We Do?” Each session has a worksheet to evaluate the practices in your congregation and make a plan to move forward. I would envision the stewardship doing the generosity sessions, evangelism doing the hospitality sessions and so on. 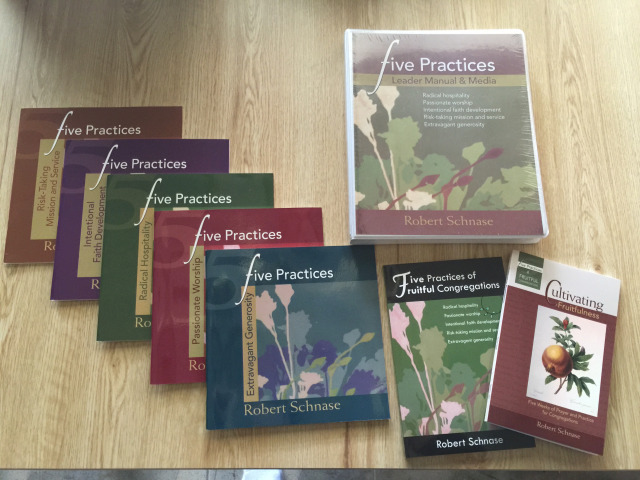 The “Cultivating Fruitfulness” participant book is a five-week all-congregation study, one week for each practice. The idea is you invite everyone in the congregation to participate in a short, 5-week small group experience. They key is finding and prepping the small group leaders. There are 35 daily devotions (5 weeks times 7 days). Congregational members are invited to engage in daily prayer and reading for 35 days. The notebook contains a Leadership Manual and six DVDs. The leadership manual has a timeline that starts six weeks before the series begins and extends through Celebration Sunday. We have a detailed suggested schedule below. The notebook has a job descriptions for each team. It includes a congregational work day and a pledging component. The DVDs contain videos, teaching sessions, presentation slides and publicity materials. This leadership package (one of everything) costs about $100. Life groups are the key to deepening a congregation’s spiritual life and also to closing the back door. People who have life-long friends don’t quit easily. They will weather hard times and tough conversations. If new members of a church don’t connect to a group and make friends, they will leave within six months. Worship alone simply doesn’t provide enough opportunity for people to interact beyond a introductory level. Growing a congregation in depth and breadth requires intentional ministry in groups. Finally, there is tremendous synergy in getting a whole congregation doing the same thing at the same time for a couple of months. It seems we only do this for capital campaigns. What if we spend that amount of time, energy and organization on spiritual growth? Order a complete set of the materials to familiarize yourself with what’s available. $87 in 2015. Then order individual pieces after you’ve started by ordering the set and have familiarized yourself by browsing all of the material. El libro, Cinco Practicas de Congregaciones Fructíferas es disponible en Español. Here is a post on Recruiting Small Group Hosts. JULY Preparation * Talk with key Leaders and Council members about the initiative. Ask them to be in prayer about it. * Secure council support and approval. * Determine funding needs and sources. Budget. * Get dates on the calendar. AUGUST August 9, 16 Recruiting * Key leadership begins reading Five Practices of a Fruitful Congregation. * Recruit team leaders. Divide your average worship attendance by 10. Plan on having at least that many groups and leaders. * Include initiative in congregational prayers. August 17 August 23 Planning * Hold the initial meeting of the Leadership Team. * Watch the introduction video segment, set goals for the initiative, identify potential leaders for the planning groups and support teams. * Recruit\confirm leaders for the Planning Groups and support teams. * Work with team leader to recruit and train group leaders. August 31 September 6 * Post all small groups in the church foyer. Allow for sign ups, in the foyer, online and by calling the office. * Begin announcing the upcoming initiative and Sunday series through the church newsletter, bulletin, website, social media, worship services, posters, and other communications. * Communicate dates of events and other details. * Key leadership participates in promoting the initiative. * Have a follow-up meeting with the Leadership Team to check in & confirm goals. September 7 September 13 * Include the initiative in the prayers of the church now through the end. * Begin announcements in Sunday School classes and other small groups. * Begin distributing copies of Cultivating Fruitfulness to the congregation and a date specific schedule for the devotions. * Congregation reads seven devotions on the Radical Hospitality in Cultivating Fruitfulness in preparation for next Sunday’s sermon. * Begin announcing the church-wide Work Day and Celebration Sunday. * Congregation reads seven devotions on the Passionate Worship in Cultivating Fruitfulness in preparation for next Sunday’s sermon. * Planning Groups meet for session 1. * Promote the church-wide Work Day and Celebration Sunday. * Congregation reads seven devotions on intentional faith development in Cultivating Fruitfulness in preparation for next Sunday’s sermon. * Planning Groups meet for session 2. * Congregation reads seven devotions on risk taking mission and service in Cultivating Fruitfulness in preparation for next Sunday’s sermon. * Planning groups meet for session 3. * Congregation reads seven devotions on Extravagant Generosity in Cultivating Fruitfulness in preparation for next Sunday’s sermon. * Planning groups meet for any ministry initiatives, workday projects, and presentations for the Celebration Sunday. October 19 October 25, 5th Sermon Celebration Sunday Sermon on Extravagant Generosity. * Celebration Sunday is held this week, Planning Groups participate and and make presentations.